ULTRAMAN is recreated as a magnificent pre-painted model kit. Despite its large size, the components are simple, and easy for anyone to assemble. No skills or tools are required for assembly. 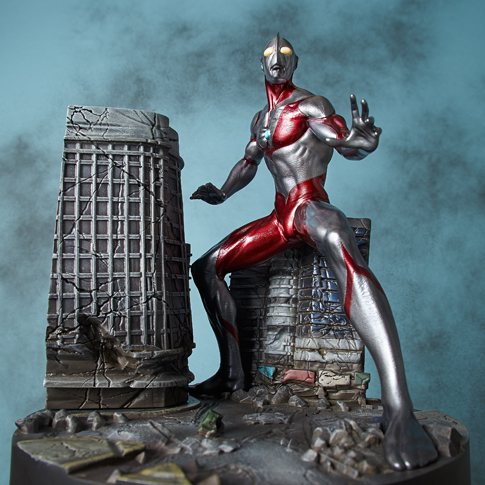 The original sculpt was done by Erick Sosa who was inspired by various motion pictures and created this ULTRAMAN with his own unique style and flare. This dynamic sculpture is a new and unique take on the classic character. The painted metallic colors provide a different finish from the ULTRAMAN of the past. The beautiful contrast with the wrecked buildings on the base is another highlight. ULTRAMAN first aired on Japanese TV in 1966 and has fascinated fans for generations. Its popularity continues growing every day throughout the world.